Join us at the farm for a morning of nature journaling. The workshop will start out in our indoor venue space looking at Mary’s journals and popular nature journaling books while conversing about the various techniques of nature journaling. Mary will expound on her personal practices, which involve a combination of writing and drawing while guiding participants in how to compose their first journal entry. The second half of the workshop will entail finding an inspirational spot on the farm to create a journal entry. In closing, participants will gather to share about their experience of creating their first entry. For those interested, Mary will talk about drawing plants and give a demonstration. Participants will be provided with an unlined journal to use during the class and to then take home if sign up occurs by July 23rd. If you sign up after July 23rd, please bring an unlined journal. Participants may bring pens, pencils (regular, colored, watercolor, etc. ), markers, etc. to enhance the experience. 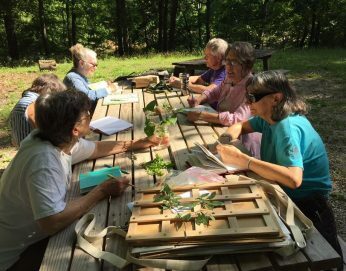 People of all skill level are welcome—nature journaling is more about observing and reflecting than creating a perfect drawing.